Helical piles are often used to lift or hold a foundation or wall in place, limit settling, or provide the resistance necessary to stop a house from sliding downhill. 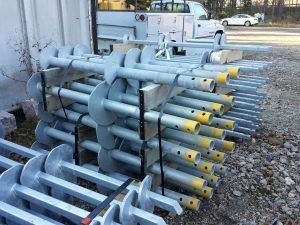 Piles are also referred to as piers or anchors, and have many uses that can make them ideal options for foundation work in a variety of circumstances. If the soil on which a new house will be built or a preexisting house stands is not capable of supporting a standard spread footing foundation, helical piles might be the best solution. Pile installation may be relatively easy with a wide range of soil types, but may be unsuccessful when dealing with buried objects, large gravel, or hard rock deposits. Piles are versatile foundation tools that can be preinstalled as a new structure is being built or retrofitted onto an existing structure. Foundation experts can install piles quickly and quietly as modular systems with leads and extensions for increasing load capacity. Not only are piles capable of bearing loads immediately after being installed, their capacity may actually increase over time in most types of soil. Construction equipment including an excavator and a hydraulic motor is usually required for pile installation, though these supports do not typically require extensive excavation. These tools do not produce soil cuttings, so the installation process can be considerably less messy than other types of foundation work. Even if clearance is limited, piles can be installed at nearly any orientation – including horizontally. Foundation work is typically best left to professionals who are certified and trained, carry insurance, offer warranties, and can complete a job quickly. Experienced contractors that specialize in foundations can help homeowners determine whether piles are the best approach to resolving problems with their foundations and install helical piles swiftly and correctly if they are the right solution.